1) We are still accepting entries to win a $30 gift certificate to FumeeWorld.com. Just fill out this survey and include a valid email address. Your answers will help us improve StogieGuys.com. Plus everyone who participates will receive an email with a coupon code for 20 percent off any purchases from FumeeWorld.com. 2) Those anti-smoking censors are at it again and this time the target is the new Incredible Hulk movie. the AMA is whining that William Hurt’s character, Gen. Thaddeus”Thunderbolt” Ross, is seen with a cigar throughout the film. They say that by showing cigar smoking the movie encourages kids to smoke, but you’d think they would be more worried about the fact that the movie has a man gain superpowers by being in the blast radius of a bomb, which would seem a far worse message for children. 3) Here’s an odd one: apparently Mel Gibson and Britney Spears held a meeting at the exclusive Havana Club cigar room this week. No word on what, if any, cigars were smoked at the superstars’ pow-wow. 4) Inside the Industry: CAO’s much-hyped new cigar will be called the Lx2 meaning ligero times two – much like CAO’s other lines the Mx2 (Maduro) and Cx2 (Cameroon). Punch Cigar’s pot-bellied, trash-talking mascot, Mr. Punch is celebrating a birthday with a series of promotions in July, including exclusive Punch humidor giveaways. Bucanero Cigars owner Robert Spoden (who we interviewed here) told European Cigar Cult Magazine that he wants to sell the highly-rated boutique cigar brand. 5) Around the Blogs: Keepers of the Flame lights up the Padrón Palmas. Stogie Review smokes the J. Fuego Delirium. Velvet Cigar reviews an Oliva Master Blends. Cigar Command puffs on a Padron 3000. 6) Deal of the Week: Here’s a nice deal for the Macanudo lover in you. For just $49, you get a box of 10 (5.5 x 49) Macanudo Cafe Hyde Parks, plus a spiffy Macanudo ashtray. Grab yours here. …never had one so I wouldn't know. No not a Freudian slip. I haven't tried the Oliva Master Blend 3 myself, but I've heard good things. "I smoked this one down to the very nub, unlike their Nub line, this cigar is worth the burning of the fingers to the very end. This cigar ran me about $12 and it was worth every penny." Regarding the hoopla of cigars in the Hulk, didn't the Jeff Bridges character in The Iron Man also light up a cigar several times in the movie? That movie made over $250 million, I would like to see the study that says that the Iron Man or even Hulk makes somebody want to start smoking a cigar?? BTW, that Master Blend is quite the flavorful cigar! Where can I get info on the July Punch humidor promotions? I would really like to get in on one of those? Any pics posted anywhere? 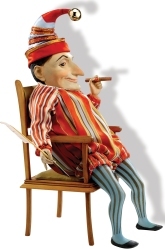 "Participating U.S. cigar retailers will be running a promotion during the month of July which 'celebrates' the birthday of Mr. Punch, but gives presents to his fans. At each store, smokers will receive 'birthday cards' which will include prize-winning notifications. First prize in each store is a box of 25 Punch cigars, either Magnums (5 1/4 inches by 54 ring) from the original line, or Punch Gran Puro Ranchos (5 1/2 x 54), plus a Punch-themed humidor with space for 100 cigars." I haven't seen any pictures yet.